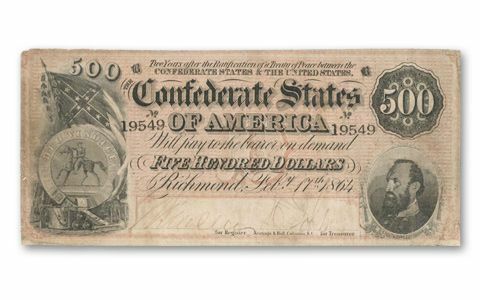 Get The Only Confederate Note That Shows The Flag! The largest denomination bank note issued by the Confederate States of America is also the only note to feature the Confederate Flag. This $500 note was issued to honor General Stonewall Jackson, one of the most beloved Southern commanders of the Civil War. Jackson was accidentally shot by his own men during a battle and died in 1863. This note was quickly issued to honor him (similar to the JFK Half Dollar, struck only months after his assassination). Fine Condition. Includes a free custom acrylic holder to protect and display this Civil War treasure (a $29.95 value).